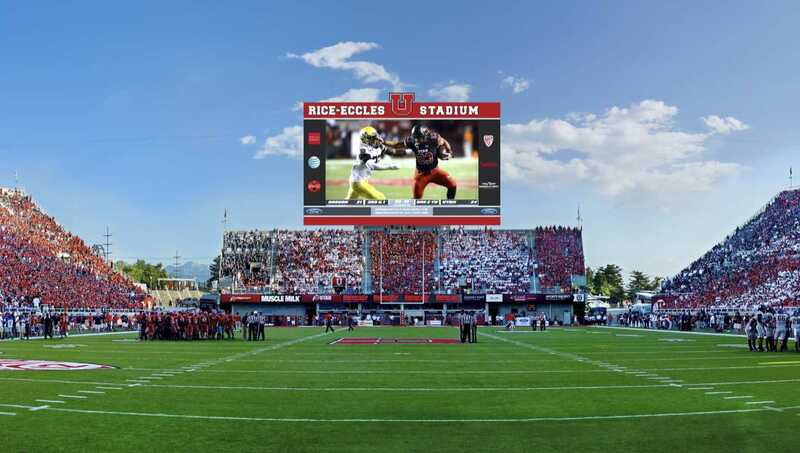 U administrators gave initial approval on Tuesday, Nov. 10, to install a new video scoreboard and sound system in Rice-Eccles Stadium that aims to make replays of the most grueling tackles and the best touchdowns larger-than-life. The upgrade will include a new 89-foot-tall and 118-foot-wide video screen — replacing the current one, which is about 10 years old — to be installed on the south side of the stadium. This will be accompanied by an updated sound system that evenly distributes announcements around the sports arena. “There won’t be the mumbling that goes on now or the screeching,” said athletic director Chris Hill. The entire project, estimated to cost $13.5 million, will be completed June 2016. The Department of Athletics will fund half of the upgrade, partially through increasing ticket prices ($2 for football, $1 for basketball and $1 for gymnastics). The remaining funds are set to come from Auxiliary Services. Lisa Eccles, a member of the Board of Trustees, said the U looked at three different designs for the upgrade before settling on the chosen scoreboard. The Board of Trustees unanimously approved the plan. “It’s just really important that we get one that’s just the right balance with our mountains and not overpowering the stadium,” she said. The current video board, Hill said, is becoming a hassle. The U flies in technicians each game to keep it operating, and several of the parts needed for repair are no longer produced. The new sound system will also reduce the noise emitted from the stadium during events that affects surrounding neighborhoods. The measure will go before the Utah State Board of Regents Friday for a final vote. If approved there, the U will award contracts to further design and construct the project. Was there any discussion about piping the radio broadcast into the rest rooms? Happens in just about every stadium in the country except ours.